Daredevil returned this weekend for its second season on Netflix, and it has become one of the more interesting parts of the Marvel Cinematic Universe. While we’re marveling at how good the show is, I wanted to take a look back at the 2003 film, and see if it was as bad as I remembered. The answer? Yes, it’s pretty bad. As Katherine noted in her look back at Elektra, the spinoff film from this film is pretty incoherent, and that’s saying something, considering that Daredevil was the starting point for that particular trainwreck. I think I can see why this film was made: it came shortly after Sam Raimi’s fantastic Spider-Man, and follows a couple of the same beats: a child gains extraordinary abilities after an accident and a tragic incident with a family member turns him to a life of stopping crime. That’s about where the similarities end, though. Like Elektra, there’s no coherent story here: there’s just a series of ridiculous scenes that pretend. We see Matt Murdock as a child, blinded in an accident, and then we jump to the point where he’s a lawyer, dressing up by night to fight crime, essentially bypassing the entire origin story of the character, going from learner to expert. Grown up Murdock, portrayed by Ben Affleck, is kind of creepy - the entire scene where he meets Elektra and essentially stalks her is cringeworthy at best - sleeping in what’s essentially a water-filled casket after downing a whole bunch of painkillers. I get that it’s to keep the sound out, but how did he not drown? What really sinks the movie, despite its exuberance, is that it takes nearly an hour and a half for the story to remotely kick in, when Elektra’s father is murdered by Bullseye, with Daredevil framed as the perpetrator, setting him up against Elektra for the big hero vs. hero fight in the film. The fight scenes are kinetic, convoluted and just flat out strange to watch: director Mark Steven Johnson does some weird things with the camera even when there’s no action: weird zooms, angles and panning shots, which makes the entire thing feel amateurish. Jumping into weird blue-echo vision might have seemed like a good idea on the drawing board for visualizing how Murdock sees, but in practice, it looks kind of ridiculous. Finally, let’s talk about the film’s greatest thing, Colin Ferrell’s Bullseye, who can probably take the claim for most outlandish villain as he kills a whole slew of people with random objects, like peanuts and paper clips. His acting consists mainly of grunting and grinning devilishly as he kills his way through the movie. He’s the best thing in the film, just because he’s so over the top and ridiculous. That acting is better than either lead (although, I do have to say that I liked Michael Clarke Duncan as the Kingpin). Affleck just stands around with his mouth half-open and blank-faced throughout the movie, while Garner delivered a pretty awful performance from the start. Like Katherine noted, Daredevil is just flat, slow and it looks awful - there’s no redeeming qualities to this film, other than that it set an extraordinarily low bar for Marvel to step over when it came to putting together the Netflix show. (That said, it would have been awesome to see the 1970s Daredevil concept that had leaked a couple of years ago). I can sort of understand the approach that they took: There wasn’t a whole lot to work with, given that only a couple of Marvel films had come out (and come to think of it, think of how awesomely bad a cinematic universe that contained Spider-Man, Daredevil, The Hulk, The Punisher, Ghostrider, X-Men, Fantastic Four and Blade would have been. The crossover films would have been astounding. Somewhere, there’s an alternate universe where that exists), and filmmakers and audiences have begun to understand what makes a good superhero film. Daredevil is useful in that you can point to it and say: ‘don’t do that’. I have to say, watching this left me with a whole new appreciation for the Netflix version, and in particular Charlie Cox in the title role. The new series looks fantastic, but it also does everything that Daredevil failed to do: take the character seriously, and really imagine how damaged the guy is. Affleck famously said that he was done with superheroes after Daredevil, but when you’re offered the role of Batman, I guess you take it. 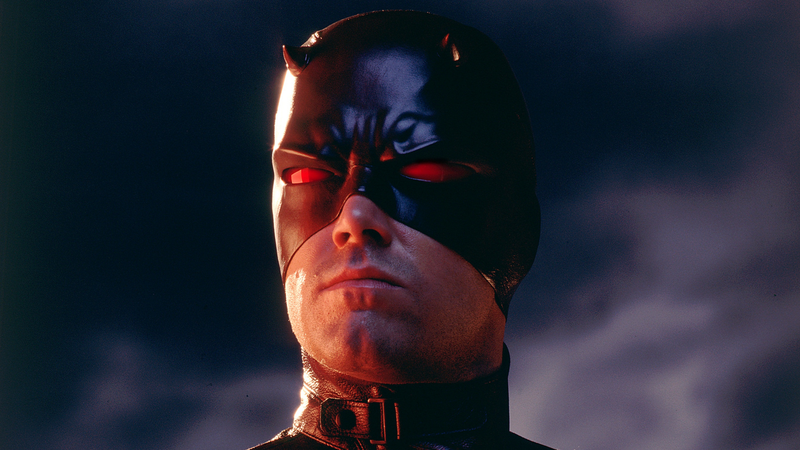 The only thing that I can conclude is that nobody in the casting process actually saw Affleck in Daredevil, but maybe this will redeem him somewhat when it comes to comic book adaptations.